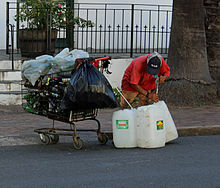 Bergie is a term used for a subsection of homeless people in Cape Town, South Africa. The word originates from the Afrikaans berg meaning "mountain" – the term originally referred to the homeless people who sheltered in the forests of the slopes of Table Mountain. The synonymous term stroller typically refers to street children living a bergie lifestyle. They are vagrants and scavengers, sometimes begging, performing odd jobs or working as informal car guards for tips. Most of them are Cape Coloureds who speak Afrikaans mixed with a few English terms, and are known for their sense of humour, vulgar language and alcohol consumption. Their lifestyle is portrayed in the 1987 novel The Strollers by Lesley Beake, the 1998 documentary film Pavement Aristocrats: The Bergies of Cape Town by François Verster, and the play Suip!, a black comedy co-written and directed by Heinrich Reisenhofer. ^ Michaelides, G.G. (1977). Candid Cape Town: A Discreet Guide to the Cape Peninsula. Cape Town: Struik. p. 56. ISBN 9780869770900. Retrieved 16 June 2014. ^ Burchfield, Robert, ed. (1994). The Cambridge History of the English Language Volume 5: English in Britain and Overseas, Origins and Development. Cambridge: Cambridge University Press. p. 471. ISBN 9780521264785. Retrieved 16 June 2014. ^ Pansegrouw, Louisa (1994). Pansegrouw's Crossword Dictionary. Cape Town: Maskew Miller Longman. p. 759. ISBN 9780636019577. Retrieved 16 June 2014. ^ a b Ozinsky, Sheryl; Woulidge, Sam; Senekal, Jurie (2003). Cape Town Don't Tell: The Mother City's (hush-hush) must-do list. Cape Town, South Africa: Struik Publishers. p. 195. ISBN 9781868728725. Retrieved 15 June 2014. ^ Barnard, Deirdre (2003). Fat, Fame and Life with Father. Cape Town: Double Storey. p. 100. ISBN 9781919930343. Retrieved 15 June 2014. ^ Barnard, Madeleine (2007). Cape Town Stories. Cape Town, South Africa: Struik. p. 157,168. ISBN 9781868729401. Retrieved 15 June 2014. ^ Beake, Lesley (1987). The Strollers. Pinelands, Cape Town: Maskew Miller Longman. ISBN 9780636010567. Retrieved 16 June 2014. ^ "Play launches South Africa festival". BBC News. 19 April 2001. Archived from the original on 15 June 2014. Retrieved 15 June 2014.